VATICAN CITY (CNS) — Critics of an agreement signed between the Vatican and the Chinese government must be patient and not quick to judge a deal that is meant to protect religious freedom, the Vatican secretary of state said. 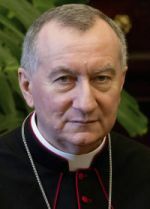 After addressing a symposium on religious freedom April 3, Cardinal Pietro Parolin told journalists that the agreement was signed “to advance religious freedom in the sense of finding (some) normalization for the Catholic community” as well as other religious minorities. Cardinal Parolin was among several guest speakers at the “Stand Together to Defend International Religious Freedom” symposium hosted by the U.S. Embassy to the Holy See. Also present was Callista Gingrich, U.S. ambassador to the Holy See. The cardinal’s comments came amid recent criticism by a U.S. official regarding the “provisional agreement” on the appointment of bishops signed by representatives of the Vatican and the Chinese government in mid-September. According to the Reuters news agency, Sam Brownback, the U.S. ambassador-at-large for international religious freedom, said the agreement has not ended the Chinese government’s repression or persecution of Catholics. “Since this provisional deal was announced last year, the Chinese government’s abuse of members of the Catholic community has continued. We see no signs that will change in the near future,” Brownback said March 8 at an event at the Hong Kong Foreign Correspondents’ Club. Highlighting the rise of anti-Semitism around the world, as well as the persecution of Orthodox Christians and Jehovah’s witnesses by Russian authorities, Gingrich said that “global crises require global solutions” and that governments, religious orders, civil society and media organizations must confront those who suppress religious freedom.